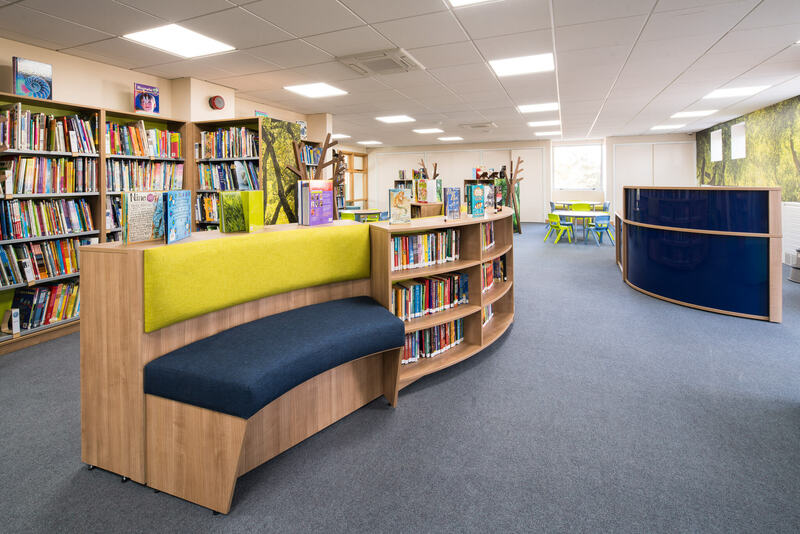 Pinnacle were approached by Porter’s Grange with a broad brief to turn a double classroom into an engaging and inspiring library space. 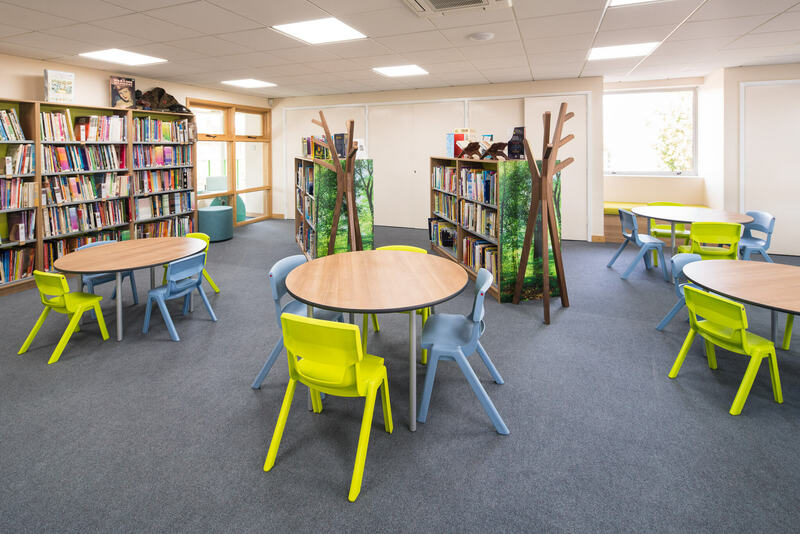 As it is an urban school in a seaside town, the school knew that they wanted to transform the library into an ‘enchanted forest’ in order to bring the outside in. 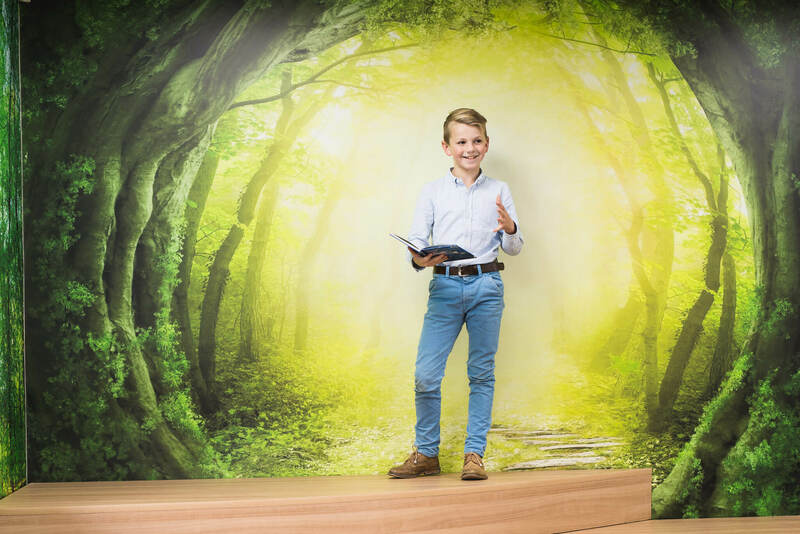 The Design Team at Pinnacle looked at several concepts for the enchanted forest including Beatrix Potter, fairies and cartoon animals – all including bright and vibrant colours. Finally, a more realistic concept was chosen which concentrated on natural tones, yet still incorporated elements of a fantasy theme. 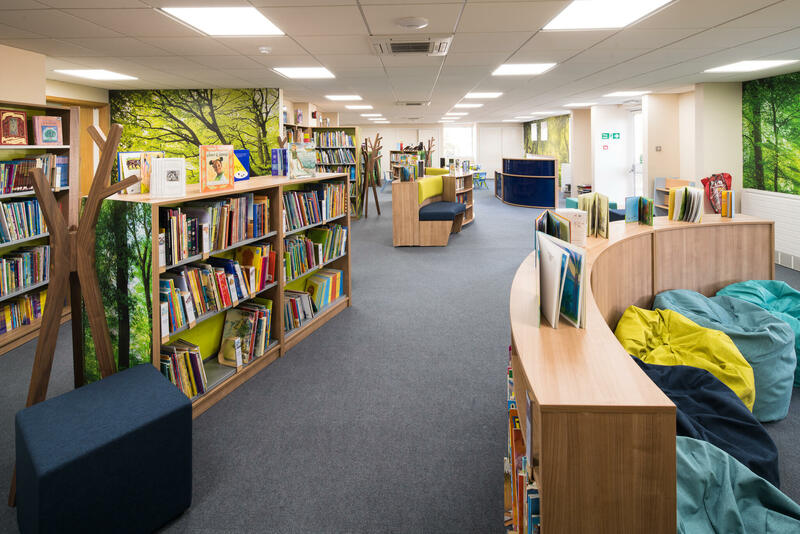 To achieve this the design scheme used a lot of woody colours and greens, with graphics playing one of most important parts in this. 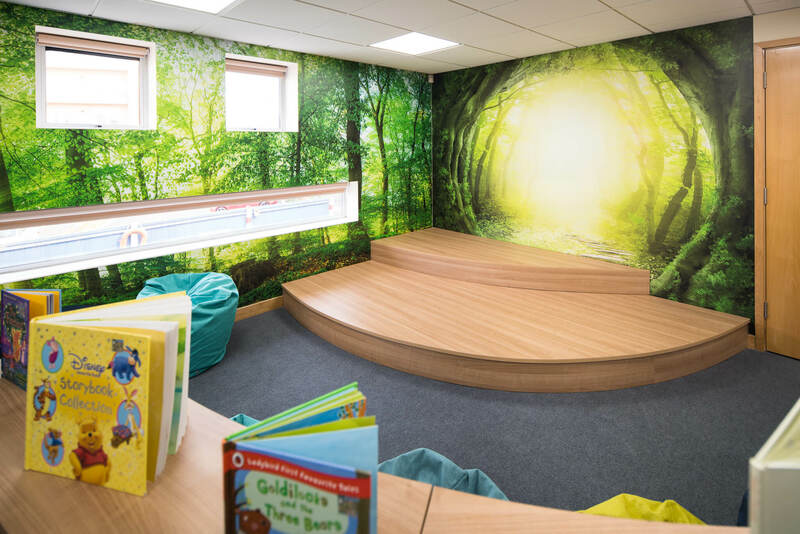 The large graphics are of forest scenes and can be found on the ends of our Quattro bookcases and on the walls. 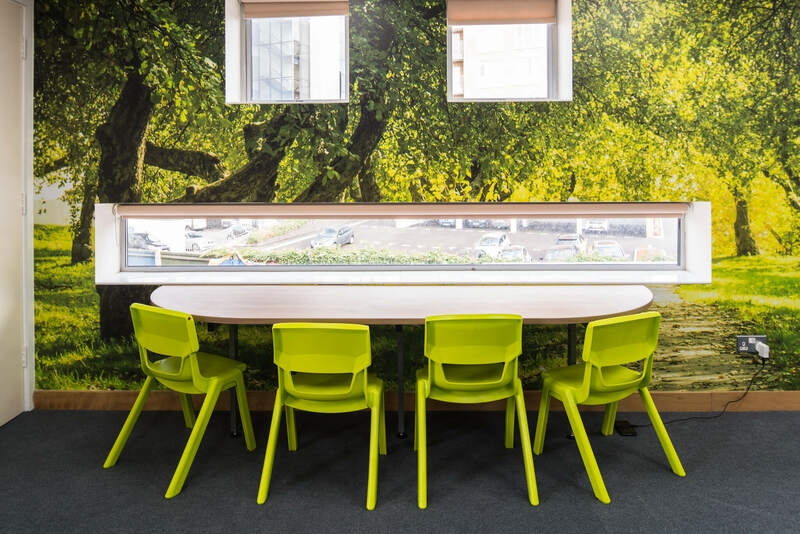 The school was provided with a variety of sketches, images and concepts of the room, including the wall graphics, two miniature plastic chairs to help visualise the full size product, pieces of wood from a bespoke furniture range and fabric samples from our upholstery swatch. Our designer’s favourite part is the graphic by the stage where it appears you can walk off into another land completely. 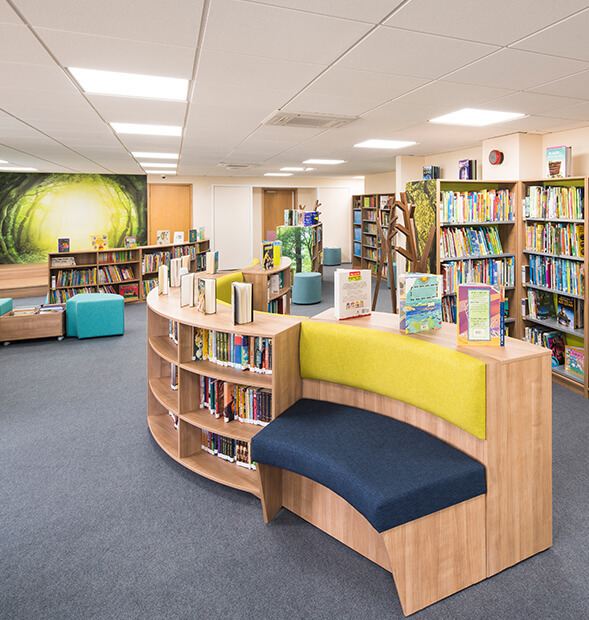 A key element of the brief was to futureproof the library. 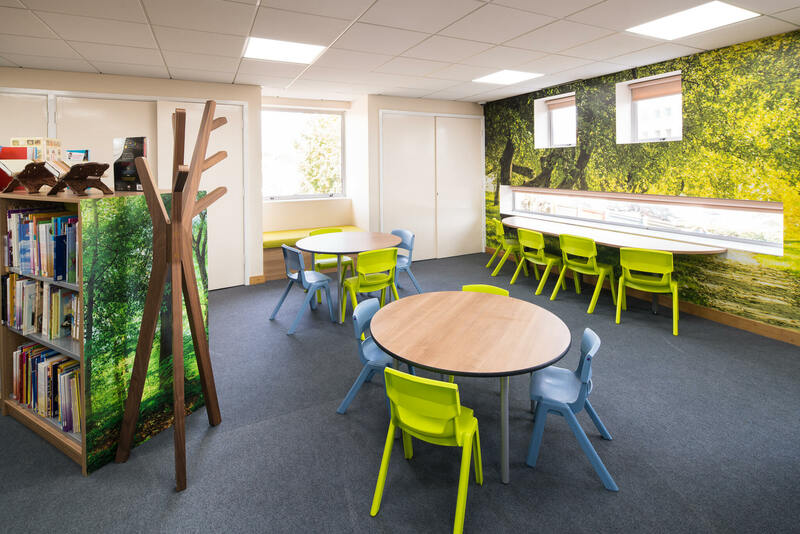 The school wanted to be able to easily refresh the area and design by replacing graphics if they felt that the enchanted forest had run its course. 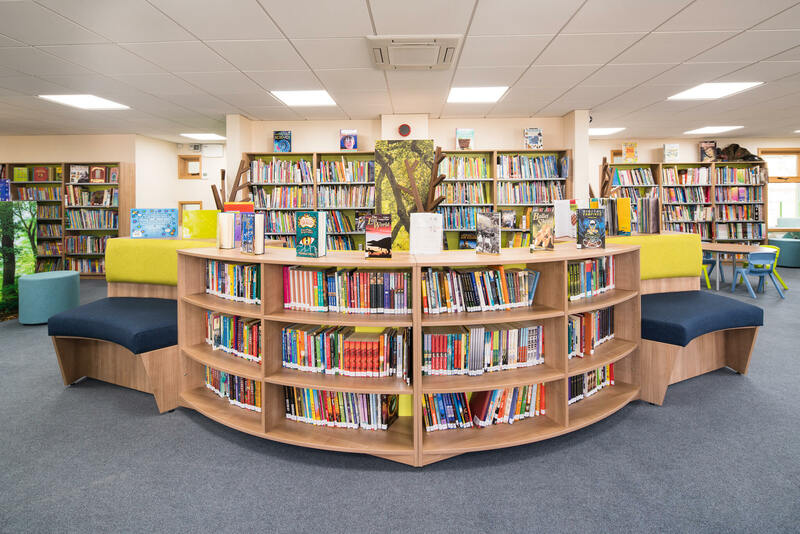 For a relatively low outlay they can change the room into a medieval castle or seaside town by having new graphics fitted onto the bookcases and walls. 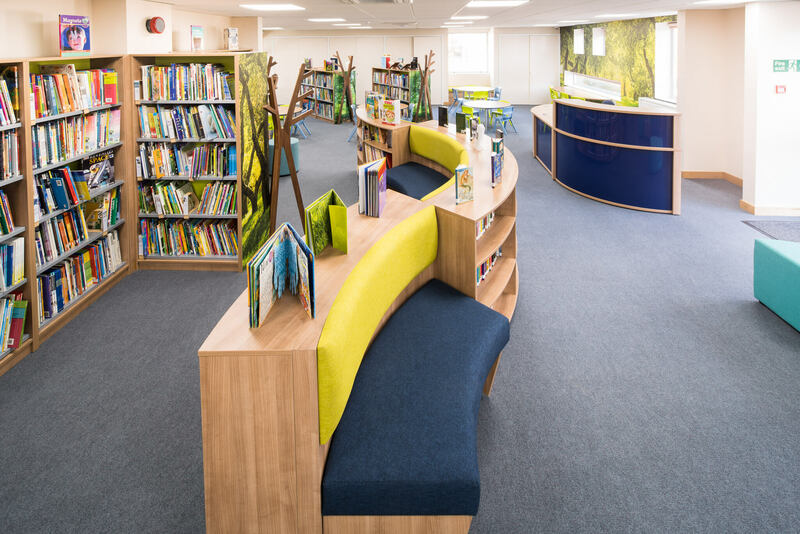 Sculpt seating was chosen as it allows for flexible seating while integrating additional bookcases to help store the library’s 14,000 books! 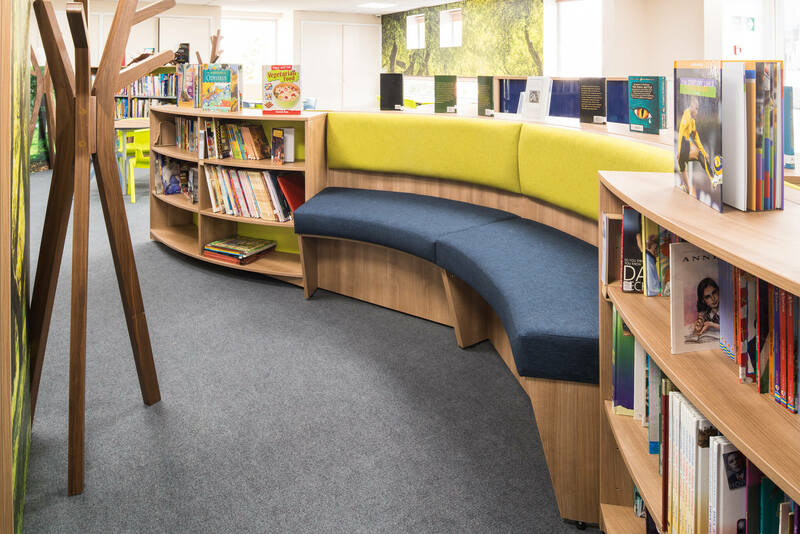 In addition to the sculpt seating is a bean-bag area and tables surrounded by Postura seating. 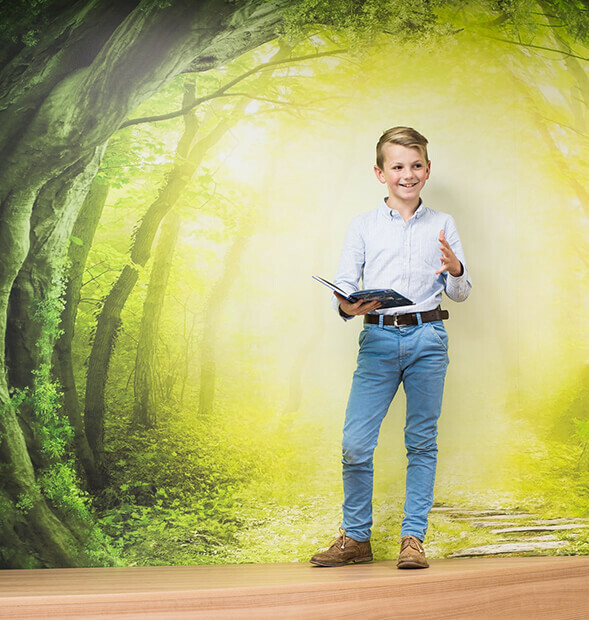 It is extremely comfortable and its durability and longevity is renowned, making it one of the most popular chairs in the education sector. 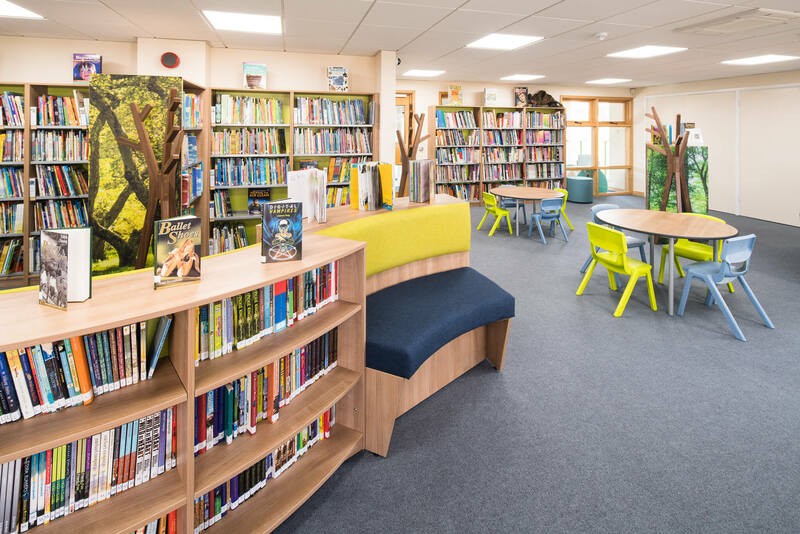 The school also utilised tree-style coat hangers around the library to add that extra touch of forest styling. 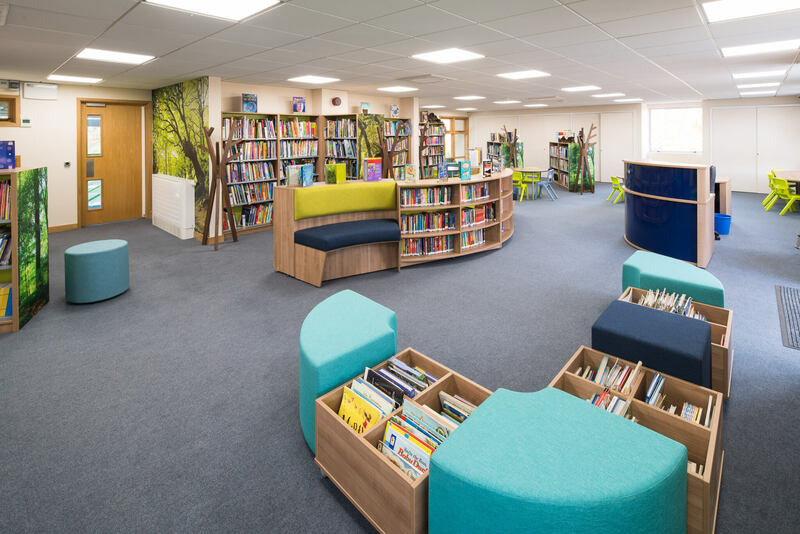 Next to the bean-bags is a small staging area, which can be used for when authors or visitors attend the library. It can be seen on the right being used by our Finance Manager’s son to educate the photographer on the Presidents of the United States!